EtherWAN's EX26262F provides a 26-port switching platform with support for IEEE802.3at Power over Ethernet, high performance switching, and the advanced management features required for enterprise environments. 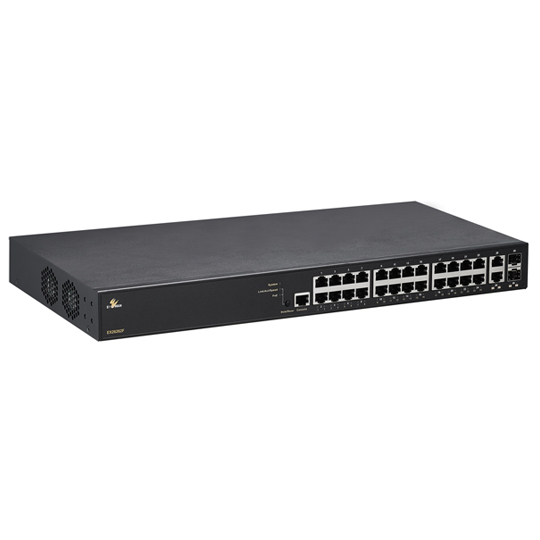 Equipped with 24 10/100/1000BASE-T PoE ports, in combination with 2 100/1000 SFP Combo options, the EX26262F is feature-rich, with 9216 Bytes Jumbo Frame support, full wire speed Gigabit throughput, and QoS support. The PoE ports provide up to 30 Watts per port, with a total power budget of 370 Watts, allowing the switch to operate a wide variety of Powered Devices with different bandwidth and power consumption requirements. These include IP cameras, wireless access points, IP phones, and other PoE devices. Robust management features include port security, IGMP snooping, VLANs, GARP protocols, and LACP, as well as SNMP & RMON. An intuitive GUI for web management simplifies switch configuration, status monitoring, and maintenance effort. » Comply with IEEE802.3at Power over Ethernet (PoE), Up to 30 Watts PoE output per port. » IP Source Guard: Prevents illegal IP address from accessing to specific port in the switch. » DHCP Snooping: Allows DHCP offer from trusted DHCP servers only. » Schedule base on WRR (Weighted round robin) and strict mode.